Having been captured in a raid upon my village, I find myself now sold in slavery to the highest bidder, a mysterious man of obvious wealth. I was conveyed to a palace, and placed into a section that was full of exotic, beautiful women from many races, lying about in various stages of undress, being attended to by colorful garbed slaves. I have been bathed in perfumed water, hair washed and scented, massaged, pampered, and prepared as though I was to be a bride. I have been dressed in the most wondrous of jewels! An exquisite copious mix of Gem Stones, and Moonstones Cabochons. As the necklace and earrings were placed upon me, I felt myself transformed. If I am to be a slave, I will be a powerful one. I am who I am and now, will become who I will need to be. Chop Zuey MissSL Chandrani Texture Change Set, available at the main store. 1. All pictures taken must feature hair created by one of the stores providing prizes for the contest. The stores will be listed below and on our website. *You must name the hair and the hair store in the description section underneath your picture. *You must include your SL Avatar user name (no display names) so that we can contact you if needed. 2. All pictures must be new for this contest. Older photos are not to be used. If photos are found to be older, or used in another manner other than this contest, they will be removed. This contest was announced on the 11th of June, any pictures older than that date will not be approved, entries uploaded since the 11th taken for the contest will be allowed. 3. All pictures must be competition entries only, not blog or advertising images. If you show the picture on a blog, or social media you must include that you are using the picture for your entry, and information about the contest. 4. All pictures must be your own work, or you must have permission to use them in this manner. Any pictures reported as not the work of the submitter will be removed. 5. Only entrants of the pictures are eligible to win the prize. If more than one person is in the picture, only the owner of the picture can win. Prizes cannot be shared amongst multiple avatars. 6. You can submit up to 5 pictures for this contest. They do not have to be submitted at the same time. 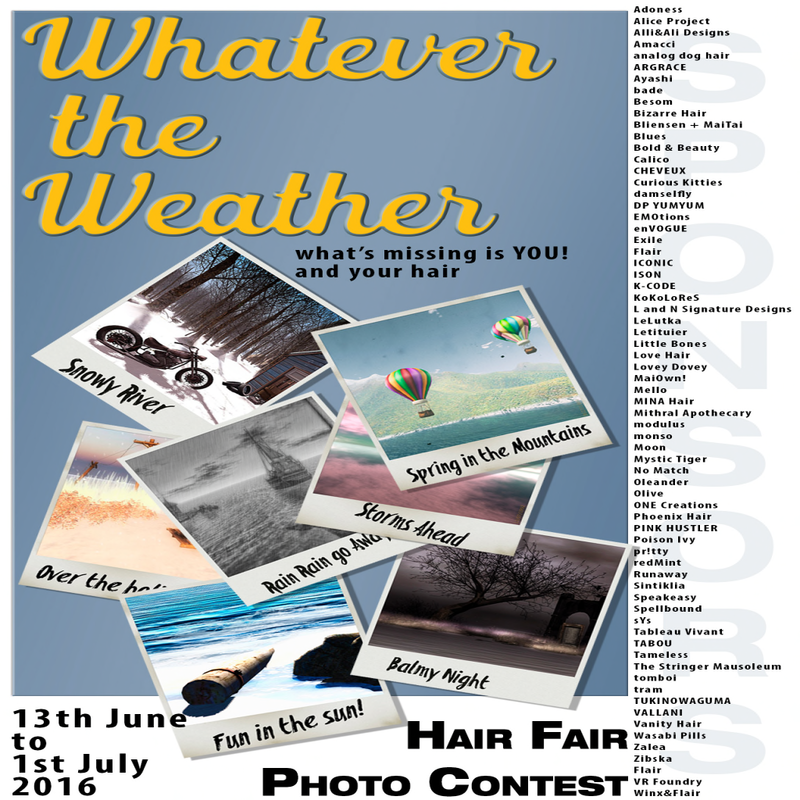 The top ten entries will have their pictures on display at Hair Fair 2016, and on the website. For more information please click on the link below! In just a couple of days, one of the most anticipated events will begin…SKIN FAIR 2014!!! The buzz has been hot and heavy about the new releases and we all are just itching to spend those Lindens! One of your must have skins to buy, is Peach DK by Silken Moon! You must stop by Silken Moon and get this exclusive skin! Peach DK is fresh looking, an ingénue innocent with the smoldering sensuality beneath, to be as sophisticated as you desire! She has the delightful touch of a light smattering of freckles across her dainty nose. There is also a tattoo for adding freckles to the body as well! Peach is one of the best skins I have seen, in a while! She came out of the folder looking as beautiful as you see her in the pictures. I have added no makeup, other than lashes, nor have I adjusted any numbers. She came out just absolutely stunning! Peach has a range that includes 5 eyebrow colors, Black Abs, CL, Nat, Blonde Abs, CL, Nat, Brown Abs, CL, Nat, Dark Brown CL, Nat, CL, and Light Brown Abs, Nat, CL. Also included are Pubic hairs, Slink Feet and Hands Appliers, and Alternative Nips. Peach DK, Exclusive for Skin Fair 2104 is a true beauty, fresh, innocent, and waiting for you! You will not be disappointed! See ya at Skin Fair!